(RNS) The election of Donald Trump, a man who suggested banning Muslim immigration to the U.S., and attracted overwhelming evangelical support, is the top religion story of the year, according to the members of the Religion News Association. 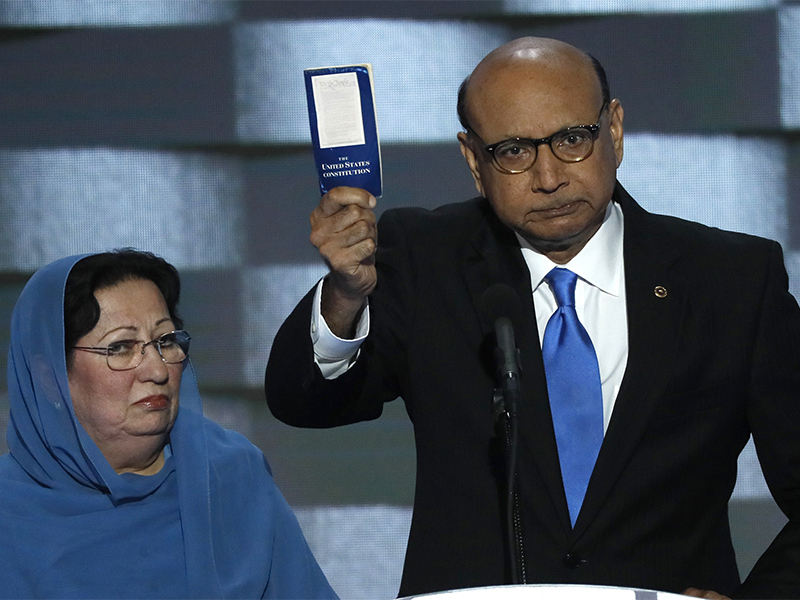 But Trump came in as runner-up for the top religion newsmaker of the year, behind Gold Star parents and Muslims Khizr and Ghazala Khan, who described the death of their son, U.S. Army Captain Humayun Khan, in Iraq to a spellbound Democratic National Convention audience in July. RNA is an international organization of journalists who write about religion. It has polled its 500 members on the top 10 religion stories of the year for 40 years. While Trump was not the most religious candidate in what started out as a broad field, his election can be credited to his appeal to white evangelicals, who voted for him by a margin of 4 to 1. Evangelical support of Trump — who has been married three times, owns multiple casinos and has spoken disrespectfully of women — was such a surprise it took its own category, coming in as the No. 9 story in the RNA poll. Several stories involving Pope Francis, including his denouncement of Trump’s proposed wall along the U.S.-Mexico border as “not Christian” and his welcome to divorced Catholics. Francis has topped the list of religion newsmakers for the last three years. This year, he dips to fourth place, behind the Khans, Trump and the Standing Rock Sioux Tribe. The full list of winning stories and newsmakers can be found here. Oh, I see the problem here. You’re clearly from some other dimension where people vote FOR candidates. You see, in THIS dimension, people actually vote AGAINST candidates. I know, I know, it takes some getting used to, but it’s not actually surprising once you learn the way this dimension operates. From any decent ethical/religious point of view Trump is the worst person ever to become US president. He has no respect for women, no respect for women’s rights of conscience, no respect for religious liberty or our constitutional principle of church-state separation, no respect for the public schools serving 90% of our kids, and no respect for the rural and small town people who mistakenly voted for him. You’ve got my vote for Tomorrow’s 3AM Trump Tweet Temptation award.? Another pseudo-religious type fakes it for money and power and that’s big news? This is a well worn story in America. Perhaps the difference here is the pres-elect was more blatant about the “pseudo” part than his predecessors in the Power and Greed Sweepstakes. Some, like Falwell Jr really outed themselves as being premium level members of the pseudo club. Eventually the righty evangelicals are going to have to stand up and say they’re not going to be played for fools any longer. Won’t they? Won’t they?! This would have been less of a surprise had RNS been a more objective source of news. They would have gone about winning the trust of conservatives and independents, so they could report accurately what was going in there as decent, honest people were long in a quandary about who they were going to vote for. THEY were surprised by the outcome because they were leaning hard in the direction of the Dems, and breathing too many of their own fumes! Eddie, it was both, in both parties. Exit polls showed that. I’m sure in 8 years (if you live that long), you and your ilk will be saying that the next Republican presidential candidate is more “dangerous,” “worse,” “racist,” blah, blah, blah than Trump, who was worse than Romney, who worse than McCain, who was worse than Bush who was worse than Dole and so on….